Washable Keyboard - Moar Stuff - You don't need it but you know you want it. Look at your keyboard. Go ahead… look. See all those crumbs, coffee spots, and droplets of…. other liquids left over from your last PornHub marathon? Don’t look all shocked, girls, we all know that a quarter of you are watching too (you go, girl). OK, let’s say you’re lying to yourself and don’t “do that”. No problem. I’ll bet you eat and or drink at your desk, don’t you? Sure you do, these days, who doesn’t? Well, have you ever had to call IT because you spilled your $6 Starbucks in your keyboard and now it adds a “h” to every word because the key gets stuck? I thought so. Anyway, wouldn’t it be nice to clean all that stuff off of your keyboard? Sure, you can turn it over and rain crumbs into your eyes but, that doesn’t take care of the stickier stuff ion it. 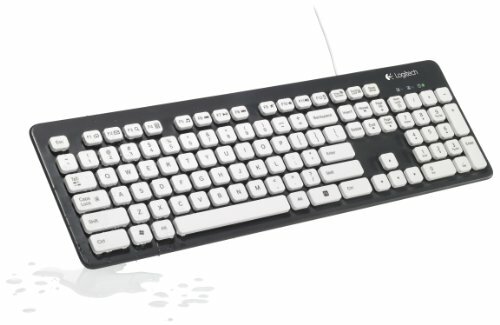 Well, this K310 Washable Keyboard from Logitech (via Amazon) will let you actually drop it in the sink and give it a good scrubbing with soap and water. You know, you need this. It’s a pretty standard USB QWERTY keyboard (with number pad and function keys) except that it can be submerged up to 11 inches (30 cm). It even has drain holes in it for easier drying. The keys are laser etched and there are LEDs for Caps, Num, and Scroll lock. 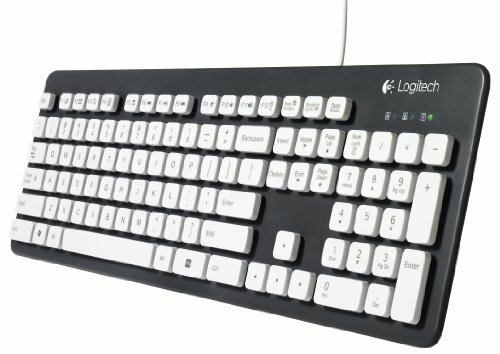 It’s also pretty durable and has a modern black and white style and the 12 function keys are programmable. That makes it really handy for getting to your favorite websites with just one hand (if you know what I mean). Dimensions: 5.75 x 18.66 x 1.38 inches. PC Compatible (sorry Mac Fanbois). Waterproof to 11 inches (30 cm). Hand wash safe. Do not stick it in the dishwasher.